Hello there! Today I have a card that uses You're So Fine glitter in THREE ways! 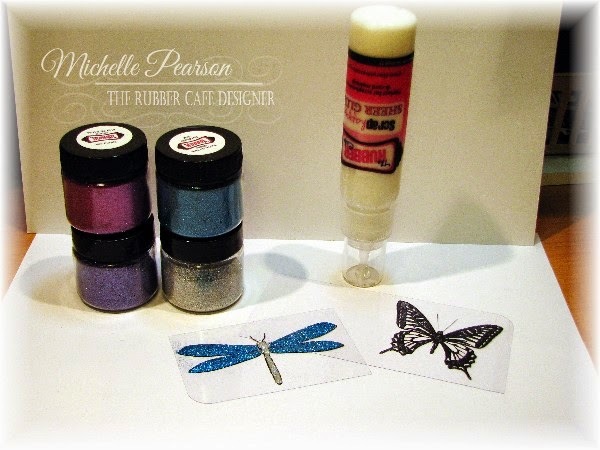 It is a glitter shaker card featuring the glitter and acetate technique and glitter as an embellishment! Bling, Bling, BLING! I once again grabbed some acetate that I had handy. You can use some of that Christmas gift packaging that abounds this time of year or acetate cardstock. 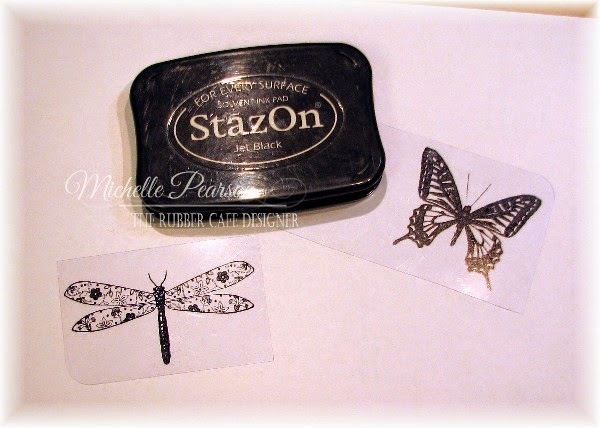 Stamp your images with black Stazon ink onto the acetate pieces as shown. Next, apply glue to the back side of the stamped acetate and then apply the glitter. 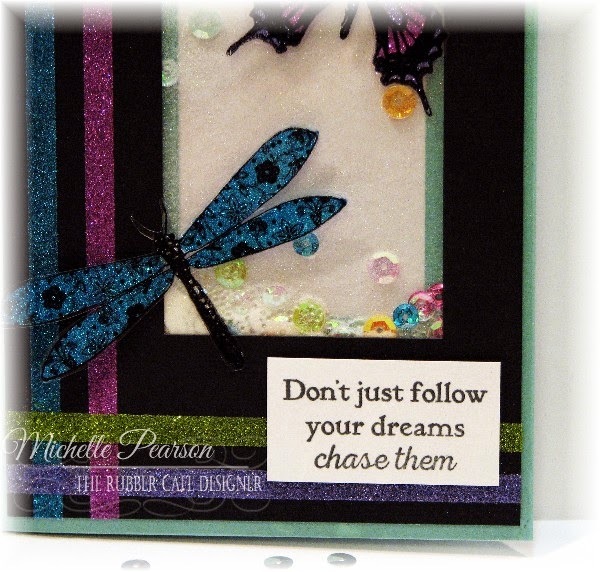 You can see the dragonfly is completed here and the butterfly awaits some of the gorgeous glitter. You will want to apply the glue sparingly as you can, but covering the entire surface. Let the pieces dry for a few hours. I speed things up by laying them glitter side up on the top of my Ott Lite. Patience in stamping is not one of my strong suits! Once dry, you will want to cut your images out closely leaving a narrow border around them. I attached the bugs to the top of my card with glue dots under the body portion of the bugs only. You can see the Diamond Clear Cool Highlight Glitter that I added to the Sequins in the shaker box. I also added a few clear round glass ball beads that I had on hand. Hint: Glue a few sequins around your shaker box randomly so that there is the appearance of bling even when the card is not being shaken! You can also see the glitter I used as an embellishment on this card. So simple...just add a strip of Scor-tape and glitter it. Add another and glitter it and repeat as desired. 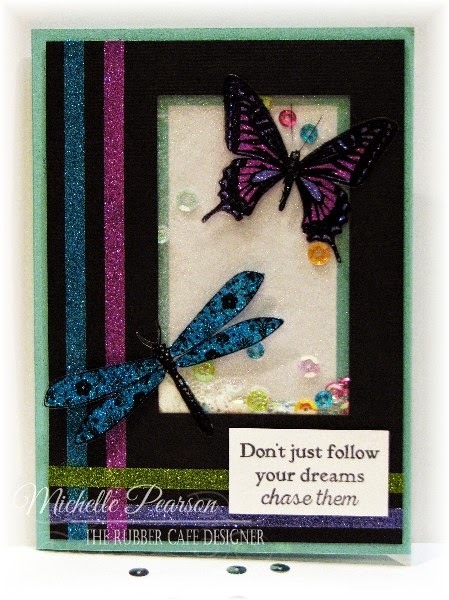 I used four different coordinating glitters to create my frame on the card. Here is a peek at the butterfly. 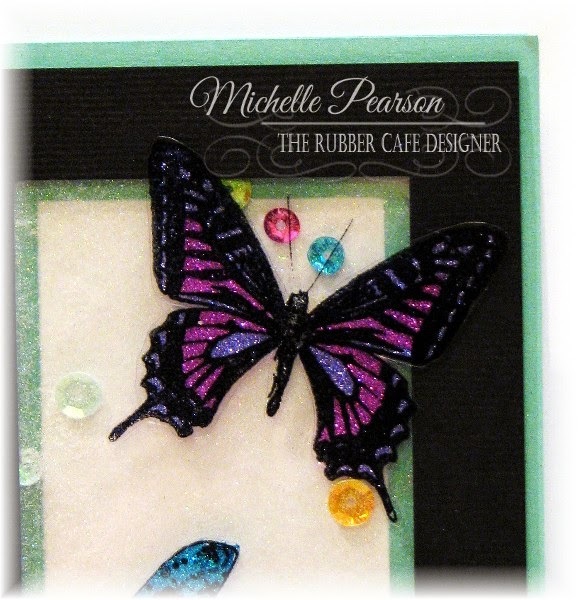 You can color them any which way that inspires you...I went with pink and purple for this fanciful flutterby! Thanks so much for stopping by today and taking a peek at my creation! I hope you don't just follow your dreams in the New Year...I hope you CHASE them!